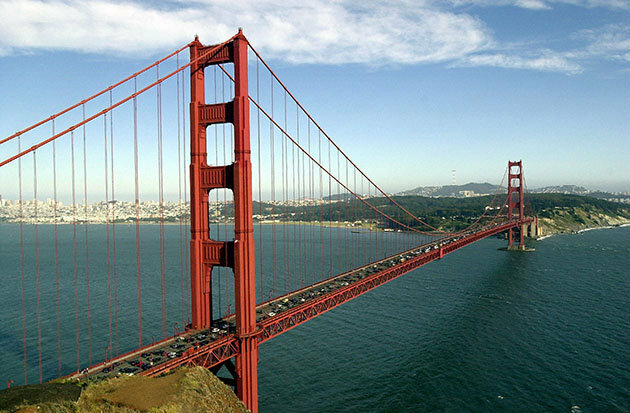 A couple visiting San Francisco’s Golden Gate Bridge on Valentine’s Day discovered an unattended camera bag in a nearby parking lot. Inside the bag: credit cards, some papers and (wait for it) over $11,000. The couple, Carlos and Barbara Landeros of Vallejo, Calif., had driven down to San Francisco for a romantic dinner, according to NBCBayArea.com. Setting out on a presupper walk across the bridge, Barbara spotted camera bag. Thinking its owner would soon return, they waited to make sure it wasn’t stolen. While the couple could have had one heck of a Valentine’s Day celebration, they turned the bag and its contents over to the police. Detectives were able to locate the owner, a Chinese tourist, Mark, who’d accidentally left the bag in the lot. He was understandably excited to have his bag returned. And the cash, it turned out, wasn’t all his: Mark was holding it for several other families with whom he was traveling. Mark went out of his way to thank the Landeroses. First he tried to call them, but had the wrong number. He then drove his family across the bridge to the Landeros’ house, only they weren’t home. Finally, they connected over the phone after Mark got the right number. He told them he put a check in the mail as a reward. NBCBayArea.com notes that the Landeroses never got their nice Valentine’s Day dinner. They wound up in traffic and had a not-so-romantic dinner for two at McDonald’s. Posted in Breaking News, NEWSTagged Couple findsreturns over $11000 found near Golden Gate Bridge, Golden Gate BridgeBookmark the permalink.